IndiGO IPO Review - Should We Invest in Indigo IPO? 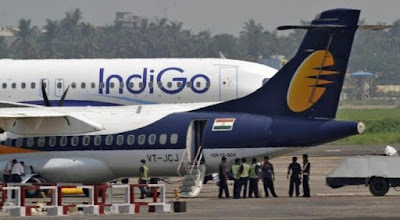 IndiGo, India’s biggest Airlines is all set for the IPO, everybody is looking for investing in Indigo IPO and the reason here we are to give you review of IndiGo IPO, should you invest in or not. IndiGo IPO is quite in trend since company registered Rs.1300cr of profit in last fiscal year ended in March, 2015. But few days back Indigo airlines promoters’ decided to offload lesser number of shares for Indigo IPO which resulted reduction in their IPO value which valued at Rs.250cr but still IndiGO airlines IPO values at Rs.3018cr which is biggest IPO in Indian market after 2012. Indigo airlines have started operation in 2006 year, become largest Low Cost Carrier (LCC) business model within short span of time. As per the CAPA rankings, Indigo Airlines is world’s 7th biggest Low cost carrier with fleet size of 97 Airbus A320 Aircrafts. Indigo currently having (biggest) 34%market value in Indian domestic air travel market (which is world’s fastest growing). To match the growing capacity of customers, Indigo has ordered 250 Airbus Planes worth of $27 Billion in August, 2015. In last 4 years, according to DGCA, Indigo’s Domestic passenger volume increased from 17.6% to 33.9%. IPO Opening Closing Dates: - IPO of Indigo will open on 27th October and will close on 29th October, 2015. Minimum Bid Lot: 15 Equity Shares, than after, multiples of 15 equity shares. Listing in: - NSE –BSE. So, on the above mentioned objectives the fresh issue of share will be used. Now we are going to study the financial performance of Indigo in past years. Indigo has collected Rs.4211cr in last 3 months via sales ended on 30th June, 2015. In last 5 years, Indigo’s sales goes up from Rs.3833cr in fiscal year 2011 to Rs.13925cr in fiscal year 2015. (almost 29.43% growth in terms of CARG). Since Fuel price gone down in last year, Indigo is able to operate with EBIDTA margin of 13.49%. Company has reported negative net worth of Rs.139cr (460%) on the quarter ended in March, 2015. Even return of equity for the last 3 fiscal years (2013 to 2015)were outstanding at 203%, 113% and 306%. Company has posted EPS of Rs.20.64 per share (on quarter ended 30th June, 2015). Average earnings per share stood for Rs.30.50 in last 3 years. 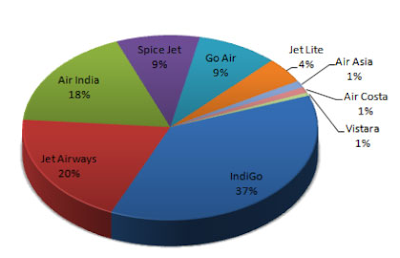 Indigo Airlines has highest market share (34%) in india airlines and its keep on increasing. Company got 97 aircrafts in just 9 years and will have 14 more by end of the year and has ordered 250 more from Airbus. Indigo airlines has lowest turnaround time (TAT) between two flights and has utilize 11.4 hours per day (highest, as per CAPA). Indigo Airlines has 87.5% of average domestic On TIME performance (highest in india). Indigo Airlines is winning “Best Low-Cost Airline in Central Asia & India” award since last six years. Why we should NOT invest in Indigo Airlines IPO? Negative Net worth is increasing at double rate, reported at 460% in last quarter. (Company management argued that they paid 3 times more dividend so their net worth is low but the facts are not favoring them. Company has mentioned in objectives that they want money to pay outstanding lease liabilities which is Reported at Rs.3912cr and Rs.3926cr in June and March, 2015 respectively, which is quite high. Indigo’s current liabilities reported at Rs.92cr which will be direct affect on current year profit. The board members and promoters of Indigo airlines are involved in some legal cases, which may affect on business/financial condition, brand of indigo. Company’s profit may go up to Rs.2400cr in 1st quarter of 2016 which is 9X to 10X of issue price, defiantly we should go for it. Also, Indigo Airlines is the only airline which is profit making, all other airlines (Spice get, Jet airways) yet to make profit. In upcoming years, cured price are expected to go down more and more. Which will directly affect indigo’s profit. Company has bought many new aircraft's which will strengthen their network and capacity of passengers in domestic market. Suggested to invest at Upper cap of IPO’s asking price.